The Delhi High Court had last month asked the AJL, the publisher of National Herald, to vacate the premises in the press enclave at ITO in the national capital. 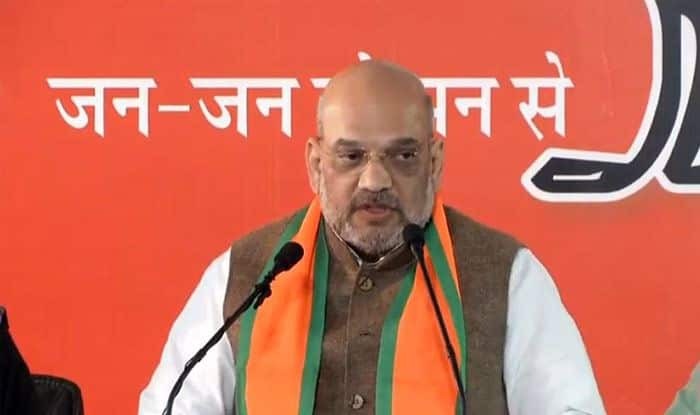 Mumbai: BJP president Amit Shah on Sunday targeted Congress chief Rahul Gandhi over a court order asking the publishers of the National Herald newspaper to vacate a premise in the national capital, saying that those appropriating public property should not target Prime Minister Narendra Modi. Shah said while Rahul’s entire family lineage was “mired in corruption”, there was not a single blot on PM Modi. “Those appropriating public property cannot target Modi. When Rahul Gandhi levels corruption charges against Modi, he should first open his eyes. His entire family lineage is mired in corruption charges and there is not a single blot on Prime Minister Modi,” Shah said while speaking at a booth workers’ rally at Silvassa. In its order, the single judge had said AJL had been “hijacked” by the Young Indian (YI), in which Congress chief Rahul Gandhi and his mother Sonia Gandhi were shareholders. “The members of the ‘Mahagathbandhan’ (the proposed anti-BJP alliance) are opposing the NRC because they think of a vote bank and we think of the safety of our country. We will detect them, delete them (from the voters’ list) and deport them,” he said.